With winter approaching, the piles of beat-up sandals and floaty summer dresses are looking a little out of place in our closet. Fortunately, mother-daughter duo Kate Berger and Ann Lightfoot of NYC organization company, Done and Done, are experts when it comes to whipping a closet into shape. Here, the pair spill their top five tips for getting your wardrobe winter-ready—and no, you don't have to toss your favorite high-school sweatshirt. 1. Going Through Each Category – "Check to see if anything needs to be cleaned or repaired. Next, ask yourself a few questions. Did you wear it last winter? If not, when was the last time you did? Will you wear it this year? Or ever? If not, it's time to let it go. If it’s a favorite item, but has been worn to death and no longer looks fresh, start a pile. At the end of the day you can make a list of possible purchases for the upcoming season." 2. Try Everything On - "If items don’t quite fit but are still in style, consider that they might fit at this time next year and are worth saving. If they are both out of style and don’t fit, even losing 10 lbs isn’t going to make them work. Letting them go can make room for new purchases or just make space to find all your favorites with ease." 3. What To Store - "If you have sentimental clothes from an earlier time in your life, consider boxing them up to save. Don’t keep them mixed in with your working wardrobe. Give yourself the freedom to keep a few things that you aren’t ready to let go of yet. This will make the whole process of cleaning out your closet less painful and more fun." 4. Shoes – "Just like your clothes, gather all your winter shoes and boots together. Check to see if they need to be polished, re-soled, re-heeled, or replaced. If there is a pair that you haven’t worn for the last two winter seasons, consider letting them go and making room for a new favorite." 5. 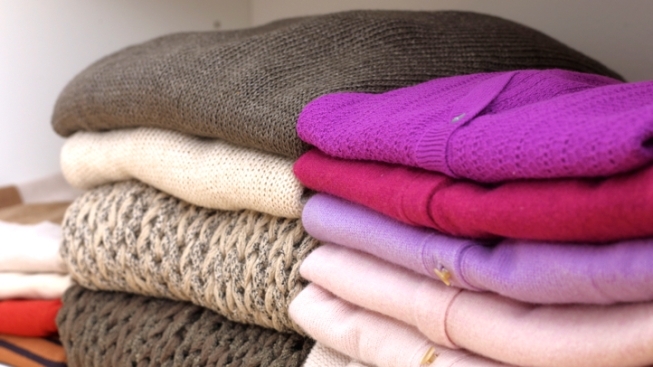 Scarves, Gloves and Hats – "Items should be folded and grouped by material. It always helps to color code and use those handy-dandy shelf dividers or bins. Consider putting lightweight scarves away for spring, wrapped in tissue; that way, they will seem fresh and new again when you pull them out in April!"